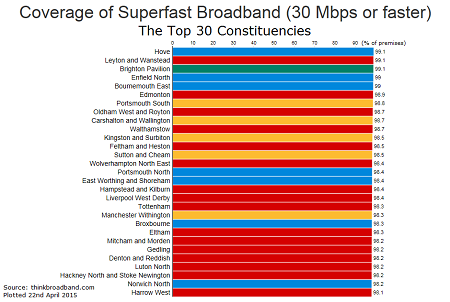 While the UK as a whole has superfast broadband (at 30 Mbps or faster) available to some 82.2% of premises, this figure is far from uniform and the sub-division of the UK into the 650 Parliamentary Constituencies highlights the areas where the most or least work is needed. 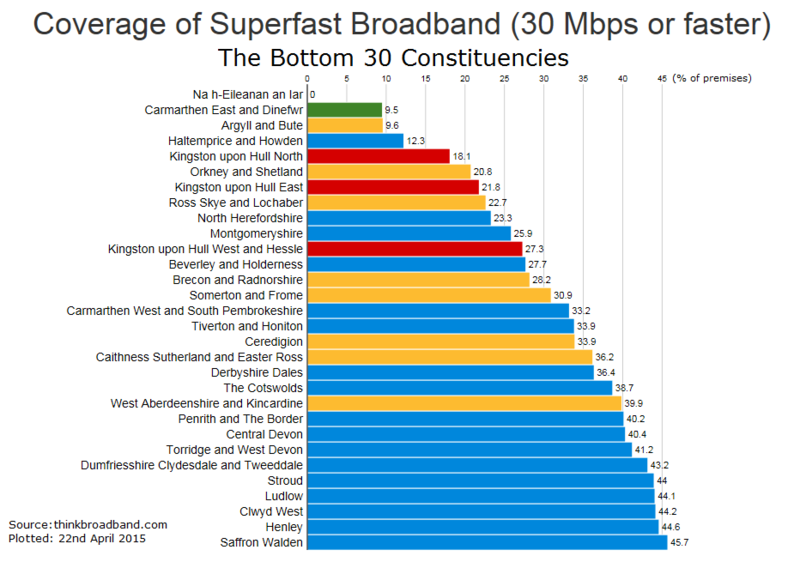 The Western Isles top the table and that is probably no surprise, but the inclusion of several Kingston Upon Hull areas will surprise some, the issue there is that the FTTH heavy roll-out from KC is great for those that have it, but still lots more work to do. For those who have not figured it out yet, the colours are based on the official party colour (for the major parties) in the coverage charts, indicating lots of Conservative candidates with questions to be asked as to why their area is doing so badly. Of course the Governments national plan never called for 90% of every constituency to be covered. The other end of the scale is shown below. The top performers in terms of coverage are invariably the more urban areas of the UK, and all of the top 30 are well above the 2017 target already. 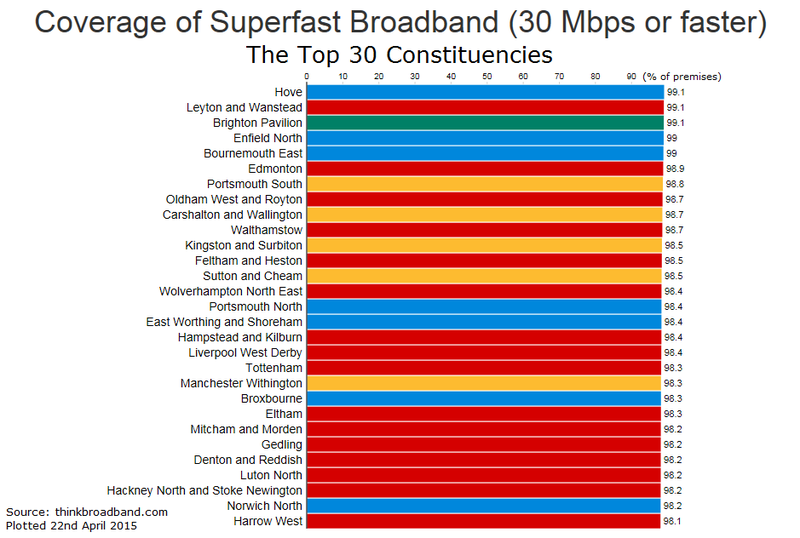 Coverage is not everything, our speed test results help to show a combination of take-up and the actual package choice people make when parting with their cash, but the correlation between high levels of coverage and decent broadband speeds is pretty evident when you look at the 30 slowest constituencies and the 30 fastest constituencies. At one end of the range we have an average that will struggle with one video stream at peak times, when at the better end 2 or 3 Ultra-HD streams should be possible. In theory the Universal Service Commitment is still on track for completion in 2015, but all the signs are that just like the EU did for basic broadband this will be declared job done by the virtue that two-way satellite services are available and reduced price install cost schemes. 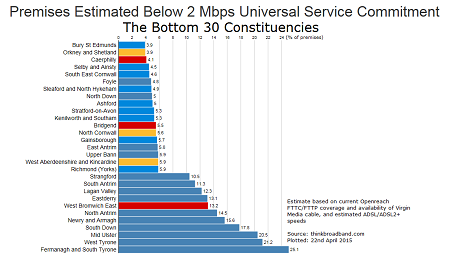 The presence of two Cornish constituencies seems to go against the success that the Superfast Cornwall project has been, but this is down to the extreme rural nature of large parts of the county and the way that VDSL2 falls off in terms of performance as the line length increases. 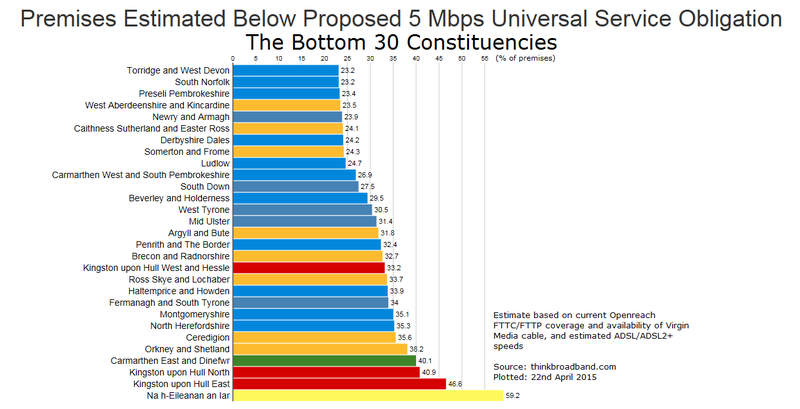 The proposed Universal Service Obligation of 5 Mbps which the Conservatives say they will flesh out if they return to power produces a very different picture in terms of the worst performing areas. The current scale of the problem which sees 24% of the Derbyshire Dales unable to get speeds above 5 Mbps means that it is impossible to consider satellite a solution unless the Australian approach of Government funded satellites are launched. Hopefully if we look back at these figures in a few months things will have improved, the overall picture in the UK showed a 1% increase in superfast broadband coverage in the last month, if that rate is sustained we might cross the 90% threshold in December 2015. If your area does not appear in any of the charts as you are in the middle ground then head over to labs.thinkbroadband.com/local to learn what the average speed test is near your postcode and learn exactly what the coverage level is for your wider community. Update 7pm: The full 650 seats can be seen in single bar chart, though to you will need to view the 3300 pixel wide copy to stand a chance of reading seat names. The coverage is improving every day and we generally update our analysis once a week, with the largest improvements in the bottom half of the bar chart. The top graph has shocking numbers for KC: To find all 3 parts of Hull in there, along with Haltemprice, Beverley and Holderness is terrible. Holding their own against some of the islands of Scotland. That bottom graph has some shocking numbers for the rural parts of Northern Ireland too. @NGA-for-all wanted us to believe that the costs for NI's 1st rollout was somehow indicative of what was going on on the mainland. Those figures show how dissimilar things really are. Promises in the commercial rollout? Of ADSL coverage? Of 2Mbps speed? I don't recall any of those promises. Meanwhile, in FTTC coverage, Bury St Edmunds exchange has 53 cabinets enabled commercially, 7 cabinets enabled through BDUK, and 9 cabinets that remain unplanned. Is that "suffered heavily"? Firstly Bury St Edmunds town is a only small part of the constituency. Secondly cabinets enabled does not equal ability to get FTTC, something that seems to have escaped the BT planners when responding to the OMR. Most likely not the exchange area itself, but the outlying villages that are in the constituency that are the issue. Hmm, I'm not sure there's a huge amount of value in mapping broadband facilities against the political colour of the constituency. The government, until recently, has not been in control of it, it has been purely down the the "market", i.e. where BT (and other operators) feel there is most profit to be found. If more Labour areas have better BB then this indicates that more Labour areas are more populous and/or will provide greater take-up. If it was a Conservative policy to put telecomms into the "market" then that's just ironic! gerada so is the cab where half the residents object to site it !!!! and the other half the residents petitioned to site it !!! gerads so which area is it you have an issue with -- or is the programme in general !!!! Aye, of course there is more to the constituency than just the town or the town's exchange. I live in a similar mixed rural-town constituency; the town is small in area, high in population. My post is simply an attempt to put out objective numbers compared to your non-specific complaint. But I still don't understand how some BT planner's mistake (dumb mistake, thankfully not replicated in other counties) over FTTC coverage applies to the sub-2Mbps ADSL coverage. And how it somehow makes BSE worse as a consequence. Just look at the results on Thinkbroadband map Exchange Area Bury St Edmunds 18k do you think they give a fair result. People are discussing USC level coverage which is NOT based on the speed test map AT ALL. The difference between coverage analysis and speed test analysis has been explained before to you blackmamba. So what you are saying is a customer on your map will not be in the USC results but in your advertised results. The speed test results that are fed by the speed test system AND THEN A SEPERATE SYSTEM that analyses what is available to people. I believe I have explained this to you several times now. The USC chart in this news item has NOTHING to do with results people see from the speed tester. @BM - when you say broadband is like a crossbar exchange it's no wonder you don't follow this! @Blackmamba The speed tests can all say 1 Gbps since it has no affect on that USC figure, as I explained there are two different analysis systems. 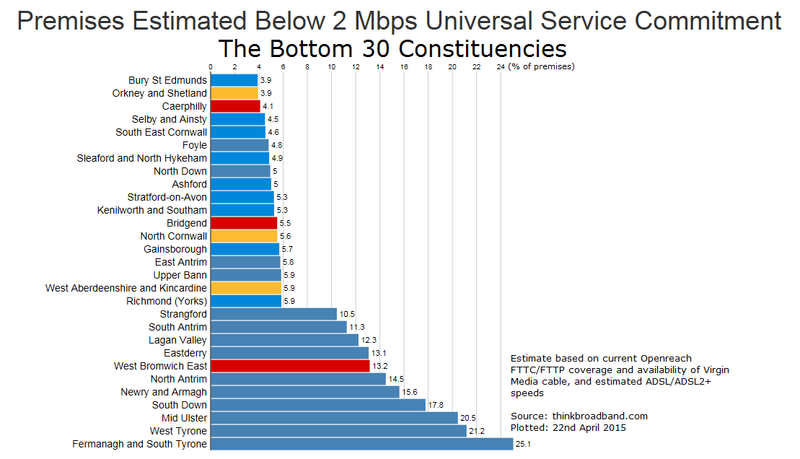 So the chart http://www.thinkbroadband.com/images/news/6935-bottom-30-usc-constituencies.png has ABSOLUTELY NOTHING to do with a 180 day window. 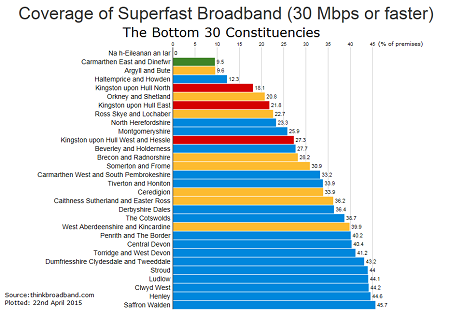 8th from bottom for poor SfB,as far as I know there is no SfB in Skye or in Lochalsh certainly not provided by OR with fibre, there are hardly any street cabinets in Skye and there are none in Lochalsh. @21again - The area includes part of Inverness. A fair result at what? Availability? I personally don't pay attention to speedtest maps, as I don't feel they *ever* give a reasonable idea of speed availability. They might have worked in the days of exchange-based services, but not for cabinet-based services; the length of a street, in the same postcode, can make a big difference. They also suffer because they depend on what package subscribers are willing to shell out on. Believe @andrew - speed test maps != availability. I think by doing a speed test on a post code it can reduce Availibility to access fibre services and on exchange based services also reduce speed to under 2 meg at certain locations. By using the speed tester beware of its results. The results on Thinkbroadband maps at Ewhurst have always been lowered due to continuous entries by registering on the map. @Blackmamba There is no mechanism by which running a speed test can reduce availability, or force someones speed to reduce. There is no need for people to beware of its results. It has been explained to you before, but you have this notion in your head and it appears to be stuck. See Surrey Web/site for OMR information. @Blackmamba you really do need to consider a change of name. "Clueless" would be more appropriate given your total ignorance of broadband and a crazy belief that a number on a TBB list can somehow affect a person's broadband speed. I hope you have read the Surrey OMR I think it high light the problem and just hope that certain people take action if they do not I will. The open market review is for broadband providers to respond to with details of their current and planned coverage. Since when has 'Ross,Skye and Lochaber' been part of Inverness? Please think what the customer is doing when he does a speed test on his post code and the results are removed after 180 days this is causing problems. Why what magic happens when a speed test is removed? Does the bogey man come around and turn off their broadband? @BM - a speed test where, and what actual problems? "Think what the customer is doing..."
He, and his modem do nothing. At the time the speed test is done, a number gets recorded in a TBB database. The number gets included in accumulated mapping results for 180 days. The number has no impact on sync speed, and no impact on the ISP. Then, or for the next 180 days. No impact. 180 days later, the number stops being part of mapping results. The removal of this number has no impact on the sync speed, and no impact on the ISP. If what you say is true, then my neighbour performing a poor speed test, because he has a poor, congested ISP, can affect my sync speed. You are talking nonsense. And the more nonsense you promulgate, the more you turn into a troll ... A distinct waste of space. What I am saying is true just checked my list for 180 days drop off only one today and two added. @BM - again, what are the problems? If you check on Ewhurst web/site they have stated the area when the problem is ever Walter has just seen the reason at last over the 180 days. @blackmamba You need to provide the URL (i.e. the link to the article) to where people say they are having a problem with what our map system is doing. Maybe you are confusing our speed test layers with the estimated speed layers for example. Call me on my E/mail address you have it. Any reason why it needs to be on email? Off to go help a few hundred other people now. @blackmamba Who said anything about speed tests. You just make up your comments it seems and enough of these have been troll like and misleading to those that come here seeking information, that your comment rights are now suspended. Oh... my post code says 68+Mbps, yet our ADSL only achieves 4Mbps max... looks like those of us lucky enough to afford 4G have affected the results for our postcode! @wwwombat NI do need explaining -Total served by a cabinet does not look too bad and I assumed they used the 15Mbps as the then threshold. But the subsidies report of c£12k each, for 1268 cabs is from BT's slides, this also covered BET deployment and bonded copper so businesses could get 2Mbps. Perhaps it just cabs limitations in rural rather than a comment on cost. Isn't it a tad cruel to suspend Blackmamba? Rather than being a troll I would say he's misguided about his opinions about the TBB speed test results. Various people over the course of many months have attempted to guide him towards the reality but it has failed, with a broken mantra to be repeated a few weeks later. In terms of halting confusion of others who visit and read the comments I felt the suspension had to take place. Compared to many other comment sites I think we have been incredibly tolerant over the many months. Ok fair enough, your site your rules. Just to say if anyone sees the correction I posted to the Hampshire article, where I found a small error in calculating the USC figures. I've double checked and makes no difference to the bottom 30 constituencies listed in this news item. It's a good question about comparing NI. What the 3rd graph tells us is that the rural NI counties have longer ADSL lines than the most rural parts of England, even after their first FTTC rollout has completed. That suggests that, in NI, D-sides are longer than in England, so E-sides are likely to be correspondingly shorter. The phase 2 rollout of deeper cabinets backs this up. Conclusion: the phase 1 rollout in NI had shorter fibre distances. Therefore cheaper. But by a significant amount? Who knows.